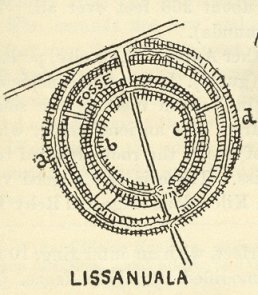 Lissanuala.—The name may mean either Apple-fort, or else, perhaps, the fort of the shoulder or rising ground (guala). It is a fine conspicuous earthwork on the summit of the ridge in Rahona West, to the south-west of Carrigaholt village, and west from the ancient castle, which raises its ivied battlements and steep roof above the rook-crowded trees near the Shannon in full sight of the Liss. There is also a good view across the river through the gap between Kilcredaun ridge and Rehy Hill over Rinevella Bay. It is a good typical specimen, very perfect, with an outer ring, 10 feet wide and 4 feet to 5 feet high, partly modified by a late fence. The fosse is 5 feet to 8 feet deep, and 10 feet wide at the bottom; the inner ring, 27 feet thick, 14 feet to 16½ feet higher than the fosse, and 7 feet to 9 feet higher than the garth, which is 102 feet wide, a very common dimension in ring-forts, whether of earth or of stone. An entrance and gangway of doubtful age are to the south. This raises the question whether the gaps and gangways occurring in the earthen forts of Clare, Kerry, and elsewhere are modern features compared to the time when the entrenchments were dug. They certainly should have been avoided as making very weak spots in the defences. When we see the fine steep and lofty rings of such forts as Lissanuala, Doonegall promontory fort, or the crescent fort at Doon in Iraghticonor, we cannot but feel that the huge gaps were an afterthought made in times when assault was less to be feared. The case of the stone forts is very different, the low, narrow gateway rarely much more than 4 feet wide and 6 feet high, and the continuous “battlements” closed up the defences almost as well as if the wall had been unbroken.